The Airborne Laser (ABL) program was killed by the defense secretary in the general slashing of missile defense to reduce the budget of the Missile Defense Agency (MDA) by $1.4 billion in 2010. The ABL will turn into a research program. 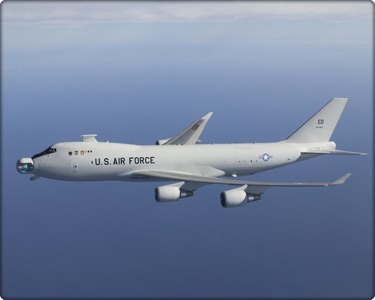 The Airborne Laser is now called the "Airborne Laser Test Bed"
The ALTB was officially killed on Feb 16th 2012 and the aircraft will be decommissioned. The Navy's Free Electron Laser will replace this program. The Airborne Laser (ABL) will locate and track missiles in the boost phase of their flight, then accurately point and fire the high-energy laser, destroying enemy missiles near their launch areas.